A website with dynamic code refers to its construction or how it is built, and more specifically refers to the code used to create a single web page. 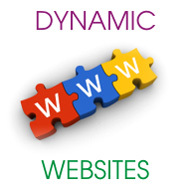 A dynamic web page is generated on the fly by piecing together certain blocks of code, procedures or routines. A dynamically-generated web page would recall various bits of information from a database and put them together in a pre-defined format to present the reader with a coherent page. It interacts with users in a variety of ways including by reading cookies recognizing users' previous history, session variables, server side variables etc., or by using direct interaction (form elements, mouse overs, etc.). A site can display the current state of a dialogue between users, monitor a changing situation, or provide information in some way personalized to the requirements of the individual user.